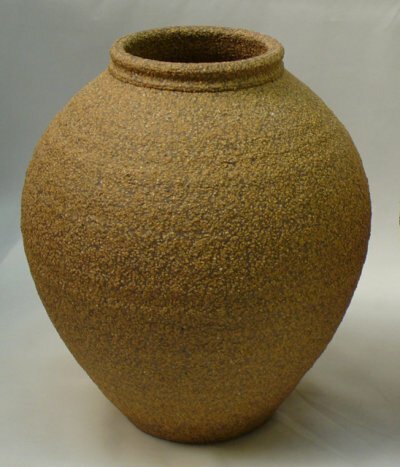 A granular material made from crushed brick, refractory rock, or other pre-fired ceramic product. Grogs are added to bodies to reduce drying and firing shrinkage and thermal expansion, increase stability during firing, and to add texture. Grogs can have particles that fall within a narrow range of sizes or they can be composed of particles from a wide range of sizes. Sculpture bodies are well known for their high grog content (20-30% is typical). The abrasive nature of the grog-containing clay can change quite markedly depending on the type of grog being used and the nature of the body containing it. It is possible to throw many grogged bodies on the potters wheel in relative comfort if as many as possible of the following are true: the body base is fine and plastic, the grog is of a narrow range of sizes, the grog has a flatter particle shape, the grog content is below 20%, the body is fairly soft. But it will be too abrasive on the hands if to many of the following are true: the body-base itself is not smooth (e.g. 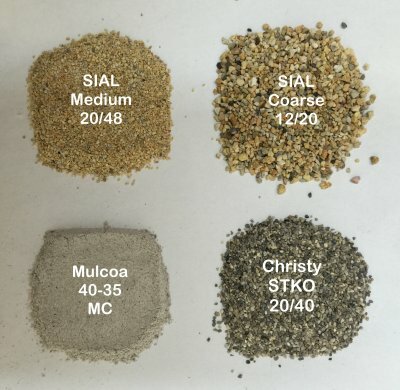 already has a range of sizes from sand and coarser clay particles), it is stiffer, the grog particles exist in a range of sizes (from very small), the grog particles are rounder or the percentage is higher. It is possible to make special purpose low shrinkage bodies having percentages of 90%+ grog (e.g. for investment casting). Of course, the range of sizes needs to be controlled to get high density since the principle structural mechanism involves packing of these particles (the clay and binders are only acting to bond the particles together for some sort of machine forming and subsequent kiln sintering). Ovenware and flameware bodies used by the pottery community often contain high grog percentages (the high porosity of the body is tolerated). The grog is viewed as the principal mechanism to impart resiliency against thermal shock failure. Such bodies (or even the grog particles themselves) normally do not have inherently low thermal expansion (testified by the fact that normal glazes fit without crazing), they simply contain so much aggregate that any microcrack that gets started is terminated immediately by the grog particles in its vicinity. 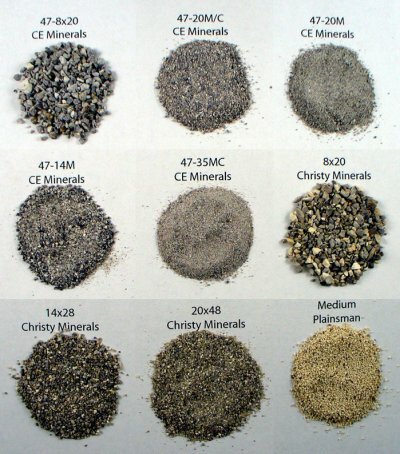 Examples of various sized grogs from CE Minerals, Christy Minerals, Plainsman Clays. Grogs are added to clays, especially those used for sculpture, hand building and industrial products like brick and pipe (to improve drying properties). The grog reduces the drying shrinkage and individual particles terminate micro-cracks as they develop (larger grogs are more effective at the latter, smaller at the former). Grogs having a narrower range of particle sizes (vs. ones with a wide range of sizes) are often the most effective additions. Grogs having a thermal expansion close to that of the fired body, a low porosity, lighter color and minimal iron contamination are the most sought after (and the most expensive). Wow, what a surface. How? A cone 10R sculpture clay containing 40% ball clay, 10% kaolin, 10% low fire redart (for color and maturity), some quartz and 25% 20x48 grog. This fine grained base produces a body that feels smoother than it really is and is very plastic. It is even throwable on the wheel. 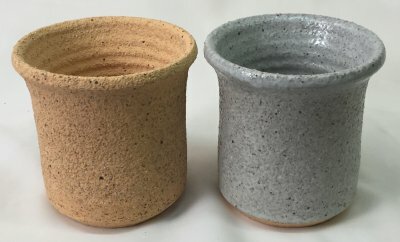 Mugs made from a sculpture clay? Yes! 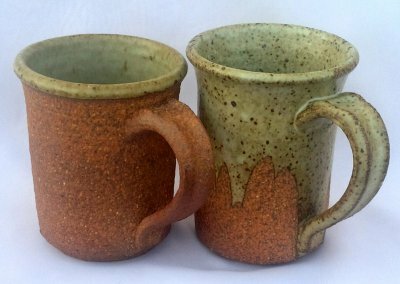 These mugs are made from a vitreous cone 10R sculpture clay (Plainsman Native Sculpture). The grog is the lighter colored specks against the background of a quite vitreous dark burning and smooth clay. This body thus has quite a bit more fired strength than the average much more porous sculpture body. 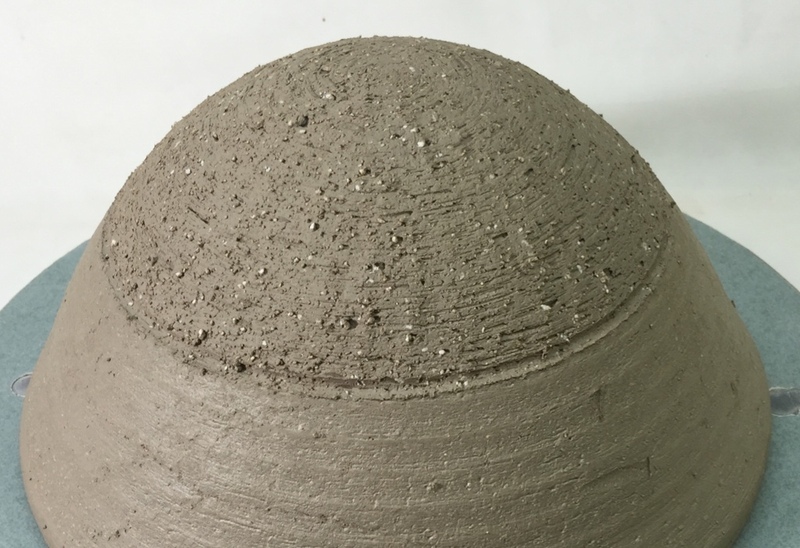 This is an example of how soluble salts can enhance the appearance of the fired surface of a cone 10R clay. This sculpture body is a vitreous dark brown burning base having lighter colored 20 mesh grog particles. 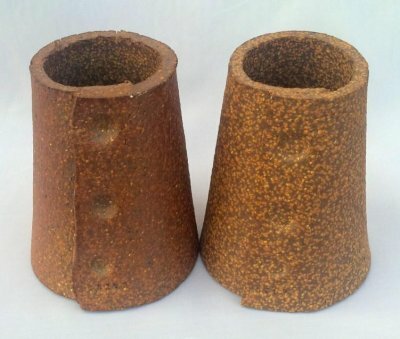 The one on the left uses native stoneware clays that contain natural flux-containing solubles that migrate to the surface during drying. 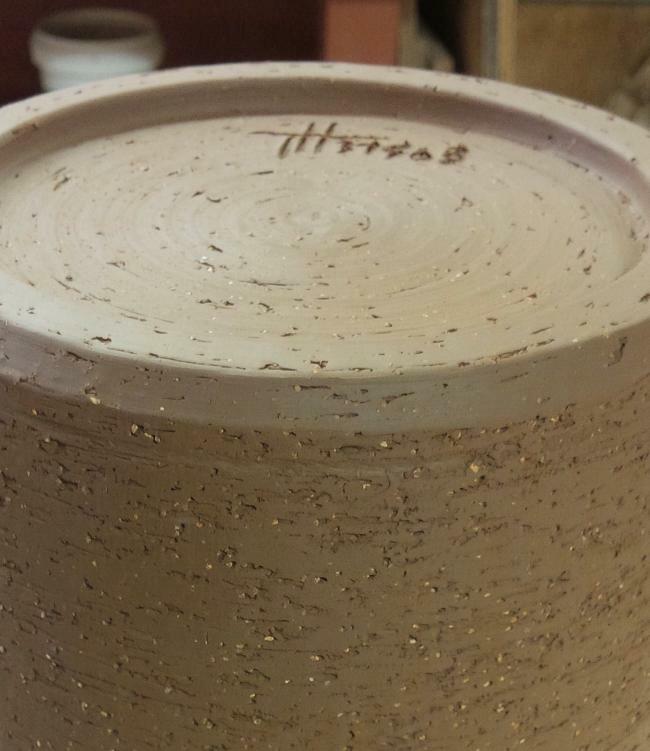 When fired they act like an extremely thin layer of glaze, producing a darker sheen on the surface. The thickness (and thus color) varies with contour and exposure of the surface during drying. The inside of the cone has no solubles at all. Grog before it is ground. Yes, it is bricks. 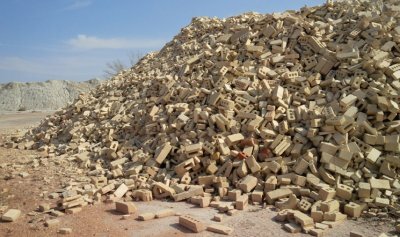 Pure grog (brick aggregate) is made by crushing bricks to produce a particulate material that is added to sculpture clay bodies to reduce their drying shrinkage (to reduce drying cracks) and impart texture. Brick manufacturers always have a certain percentage of reject and actually grind the reject bricks and clay together. These are structural high temperature stoneware bricks in a stockpile at Plainsman Clays. A closeup of 35-48 mesh grog particles (courtesy of Plainsman Clays). Grogs are added to clay bodies to impart better drying properties. Grog particles perform their drying-shrinkage-reducing function (for plastic bodies) best when they have an angular rather than round shape. These particles are from a grog that has been milled and separated into its constituent sizes in the lab. 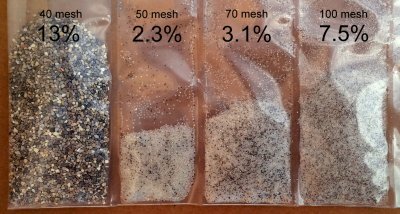 As you can see it has a wide range of particle sizes, from 48 to finer than 200 mesh. When fired ceramic (like bricks) is ground the finer sizes often predominate. Because the coarser grades have a lower yield they can be much more expensive and harder to get. But they are the most effective in reducing the drying shrinkage and fired stability of structural and sculptural bodies. Here is the oversize (from Plainsman MSculp) on the four coarsest screens we use to do particle size distributions on clay bodies. There are very few intermediate sizes between the very fine particles of the base body and the coarse particles of the grog and sand. Contrary to what I have thought up until now, lately we have found that this approach makes for greater plasticity, better drying and less water splitting than if the grog and body contain a range of coarse to very fine particles. It also feels smooth on the wheel. The SIAL grog is made by RHI Refractories. Christy is from Christy Minerals. The Mullite is not really a grog but neither is it a powder, it is made by Mulcoa Refractories. This body is a plastic fireclay base having 13% 20/48 grog and 10% 65 mesh silica sand. But the texture is far coarser than one would expect. That is because it has 4 cubic feet of perlite per thousand pound batch. If desired the surface can be trowel smooth. This works well partly because the perlite particles are soft and easy to crush. This much grog was with that much clay! This is a sculpture body named Industrial Crank from Potclays in the UK. I dried some out, slurried and screened the grog out then dewatered the remaining clay to get this. There is almost 50% grog. Yet this body is known for amazing plasticity and toughness. How is that possible with this much grog? That base clay. It is extremely sticky and plastic. Yet it has only 6% drying shrinkage. The grog has a narrow range of sizes, from about 35 mesh to 70 mesh (a high percentage is of the coarsest size). Yet amazingly, the body does not feel coarse. Why? Again, it is this clay base. Each grog particle is nestled in a buffer that firmly holds it yet gives it freedom to move. I am working on a complete report and will share from my Insight-live.com account soon. A flameware recipe. Are they kidding? 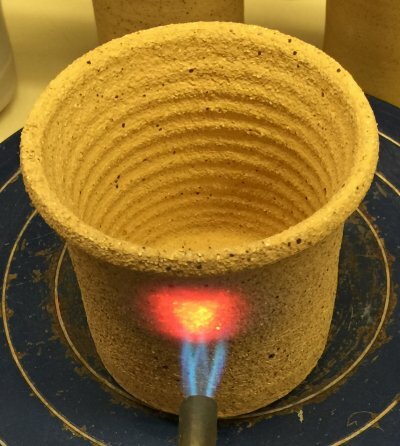 This is a flameware, made from a recipe promoted by a popular website. Are they serious? How could you throw this? Maybe it is possible, but we need an explanation. How could the page fail to mention how coarse this surface would be? How porous and weak ware would be? We find many body and glaze recipes on the internet. These almost always just sit there, taking screen space, not explaining themselves in any way. A flameware body being tested for thermal shock. Is this a joke? 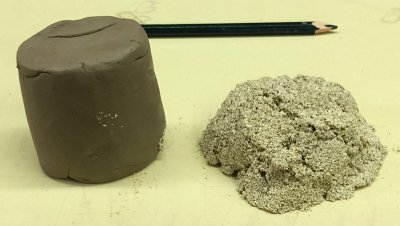 A recommended flameware recipe from a respected website (equal parts of 35 mesh grog, talc and ball clay). Looks good on paper but mix it up for a surprise. The texture is ridiculously coarse. Recipes like this often employ fire clays and ball clays, but these have high quartz contents (in a test like this a ball clay vessel could easily fail in 5 seconds). But this one is surviving still at the 90-second mark. Or is it? While porcelain pieces fail with a spectacular pop of flying shards, these open-porous bodies fail quietly (note the crack coming up to the rim from the flame). There was an intention to create cordierite crystals (the reason for the talc), it is hard to say whether than happened or not. But the porosity of 12.5% would be difficult to deal with. On the positive side, you could likely continue using this vessel despite the crack. This is the surface after trimming. M390 is normally smooth. It is plastic enough to be able to tolerate this grog without apparent loss in workability (still throwing well). And it does not feel overly abrasive on the wheel (unless your hand goes down onto the wheelhead). How is that possible? Although the particles of grog are large, they are not touching each other and readily press down into the clay.